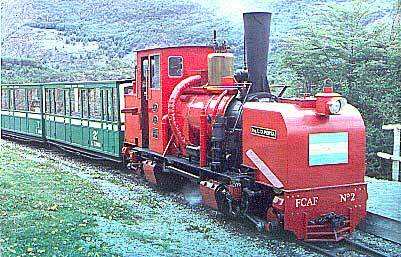 This loco was first used at the FC Economico Correntino way up in the north-east of Argentina. This was a rural 60cm gauge network. The loco then moved to a cement works 75cm gauge line, before being converted again to 50cm gauge and brought down south. It suffered a cracked axle and was on static display outside the railway's main station. 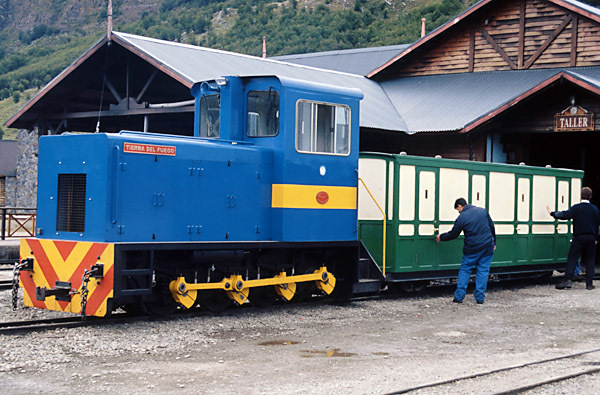 However, it has now returned to service with a new name in honour of Ingeniero Catello Muratgia of Ushuaia prison who had been a big influence in the building of the original prison railway. 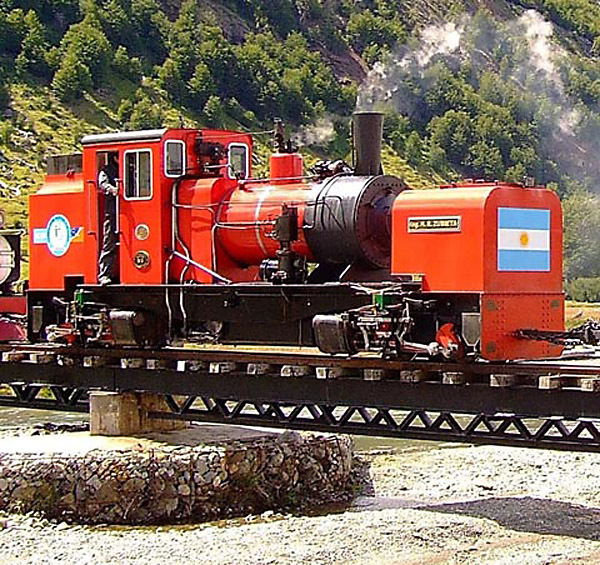 This loco, one of very few steam locos to have been built completely in Argentina,was based on the prototype Garratt articulated locos 'K1 and K2'. 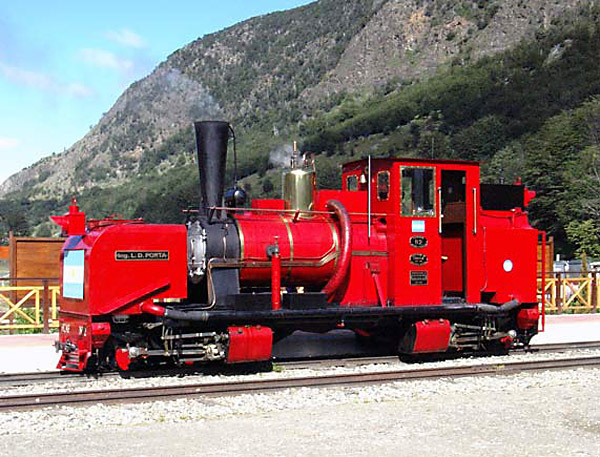 These were built by Beyer, Peacock in 1909 for the Tasmanian Government Railways and, after a long and convoluted history K1 has been restored for use on the Welsh Highland Railway in Britain. The brass cabside plates displayed her number and construction details. Carupa workshops are in Buenos Aires. Nora was built to a reduced scale to fit the 50cm gauge. At the time of construction, in 1994, a second set of parts were made, with the intention that these would be assembled at some point in the future. Unlike all other Garratts the K class and this derivative have cylinders at the inner ends of the bogies. Whilst this makes for shorter steampipes it does mean that the hot rear cylinders are right under the crew's feet. 'Nora' approaches Puente Quemado back in January 2001, below. 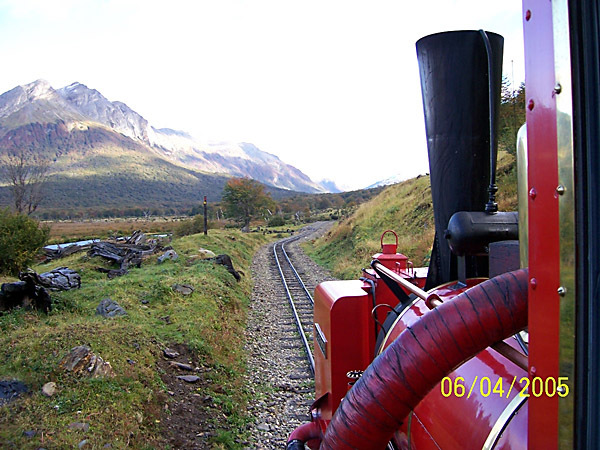 The wisp of steam from the safety valves shows that the driver is well-prepared for Macarena Bank just after the bridge. The temporary extra water tanks seen sticking up above the normal front tank were for testing purposes before the rebuild. FCAF locomotives are single-manned, helped by them being oil-burners. 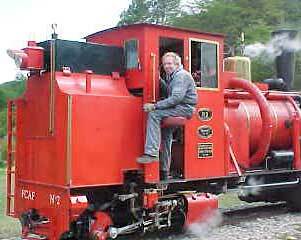 On a 50cm gauge railway the cabs are not large and it would be difficult to find room for a fireman. Driver Chris Parrott leans out of 'Nora's cab during the intermediate stop. For some years Chris divided his time between the Tal-y-llyn Railway in Wales and the FCAF - helped by their summer seasons being at opposite ends of the year. 'Camila' was built by Winson Engineering at Daventry in England during 1995. She was based on a design for the 15 inch gauge Bure Valley Railway in Norfolk, a line with gentle gradients and a far cry from the exceptionally hard work that the FCAF would demand. This was not a fault of the suppliers for they had been given little information to indicate the requirements in Tierra del Fuego. Originally she was designed with Lynton and Barnstaple-like styling, but some that has been lost as a new Tal-y-llyn Railway-built air pump and then a new chimney and Lempor draughting arrangement were fitted. One of the two ex 60cm gauge Ruston diesels used in the original construction of the line. Date and builder's number unknown. Normally used for engineering trains. One of the Rustons is seen standing at the main workshops in the photo by Martin Bane. 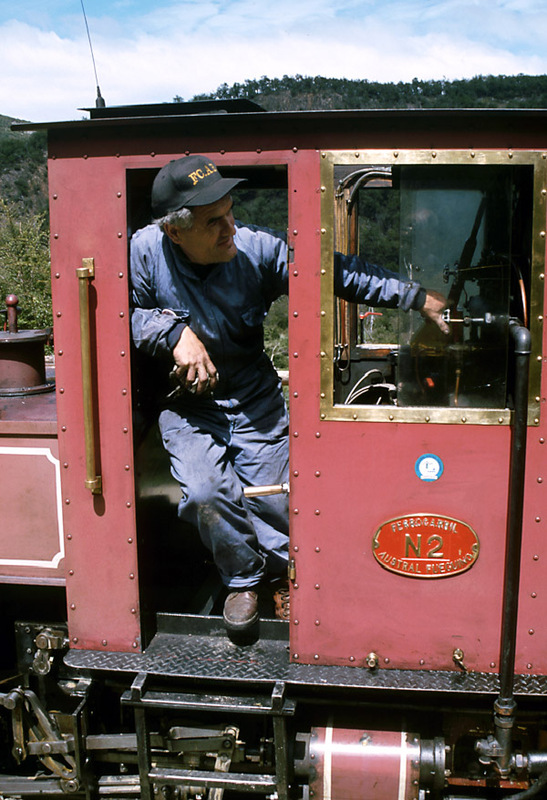 The arrival of Shaun McMahon in 1999 was quickly reflected in radical changes to the loco fleet. These were not merely the result of his passionate interest in modern steam traction, but were also necessary if the original FCAF 'toy railway' was to be turned into a serious transport system capable of carrying vastly greater numbers of passengers. • A Lempor exhaust system combined with a Kordina at the top of the blast pipe. • Direct, and large, steam (live and exhaust) passages and ports, to streamline, and thus speed up, the steam flow. • Large cross-section and direct live steam and exhaust pipes to minimise pressure drop, allowing full regulator/ minimum cut-off working and thus maximum efficiency. • Improved oil burner technology (the fuel is diesel/gas oil). • Grease lubricated roller bearings, where appropriate – with greasing being a maintenance team, not driver, job. • Single oil-grade mechanical lubrication to all other parts (cylinders and motion), no crew lubrication tasks when running. Feed is proportional to valve travel. • Direct lubrication of the piston valves, 'between the rings' for improved lubrication, reduced oil consumption and reduced carbonisation (the latter also helped by drifting in mid gear). • Valve gear optimized for the planned use of the locomotive. 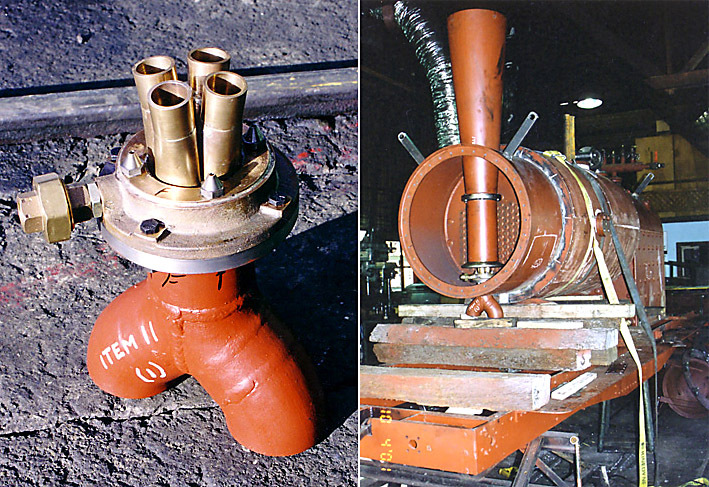 • Rail-head steam-cleaning jets to reduce the requirement for sand usage to almost nil. • Provision of advanced water treatment, ‘Porta Treatment’, proven to allow six months between washouts and to extend boiler life considerably. • Porta high adhesion driving wheel tyre profile. • Ergonomic cab design grouping all controls regularly used (thus allowing single manning which in turn reduces operating costs). • Improved air braking system based on Talyllyn Railway supplied steam-driven reciprocating compressors. • Improved state-of-the-art all round boiler design. • Redraughting, again with Lempor exhausts, to suit the modified boilers. • Piston valves of the light weight, multi-ring and articulated Porta Type. 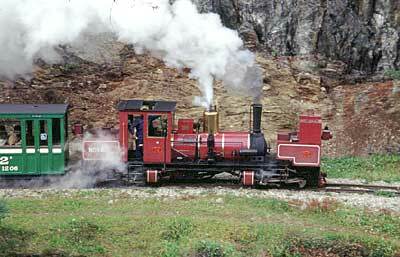 As a result of all this work the original locomotives now look very different, and additional machines have joined them. Hence, it is time to run through the fleet again. After several years use, Nora went through a very thorough rebuild under the guidance of Shaun McMahon, the railway's chief engineer, and emerged as a vastly different beast. A rebuild had been intended but was brought forward owing to severe mechanical failures experienced early in 2001. Now named Ing. L. D. Porta after the famous Argentine steam loco engineer, the loco is vastly more powerful than before and is more than capable of hauling all of the railway's passenger carriages at once! As the following photos show, Ing. L. D. Porta looks very different, with a curved front tank reminiscent of 1930-40s Beyer Garratts and a rear tank that looks as though it fell off an SAR class NG/G16. 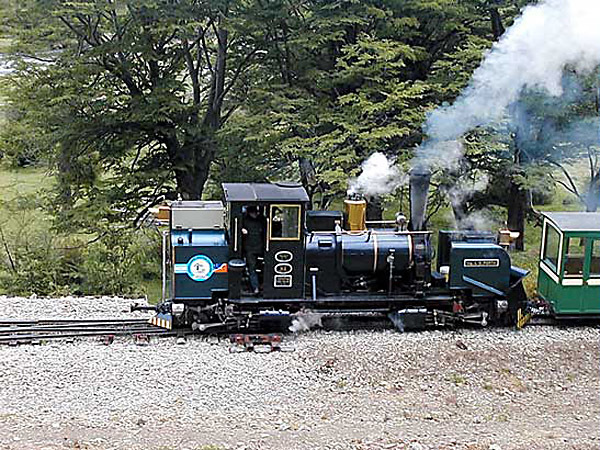 A spare boiler was already in stock in preparation for the building of a second Garratt loco. This was modified by the additional of fusible plugs, a second water gauge, a foam height meter, rotary burner and exaggerated levels of insulation. These photos show the Lempor exhaust system with its four nozzle kordina and the diffuser in place in the smokebox. 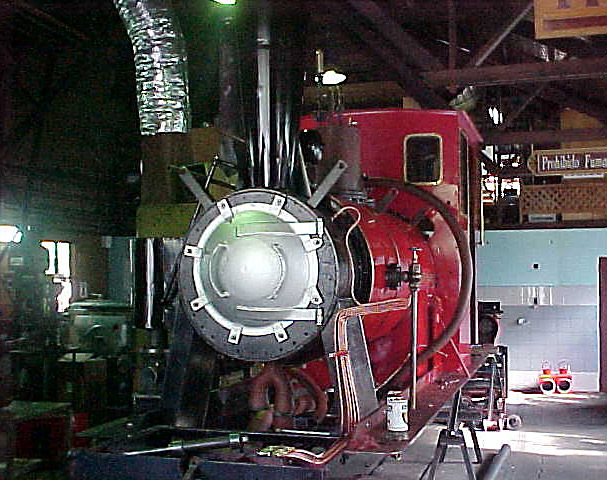 The boiler with most fittings and the cab in place on the cradle. The new higher position of the boiler is clearly visible. The power bogies received new and rebalanced wheels and axles, high adhesion tyre profiles, new cranks, proportionally fed mechanical lubrication, rail cleaning steam jets, air operated sanders and sand removing gear, etc., etc. Amongst the new features seen below, are the higher boiler, new larger tanks, taller cab, new draughting and chimney, and main steam pipes emerging from the regulator valve behind the dome. 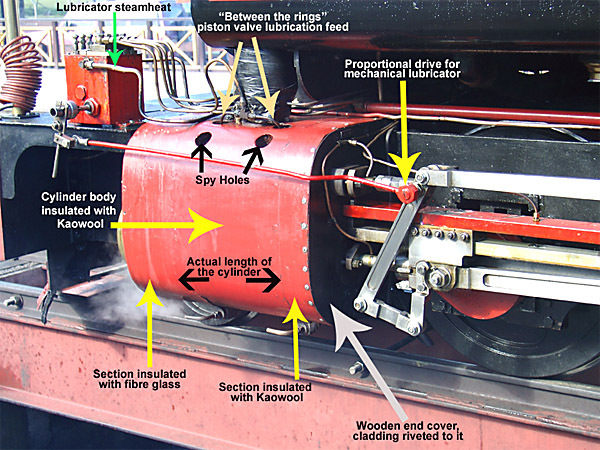 Other items of note are the foam height meter in front of the dome; the high degree of insulation applied to regulator valve, live steam pipes, injector feed pipe to the nearside clack valve, and cylinders; air operated sanding gear; new design of cranks and eccentric rod roller bearings. The air pump exhaust is separate from the chimney as is now seen to be good practice. The first stage modifications greatly increased the sustainable power output of the loco. The second stage saw many of the mechanical parts upgraded to cope with this new power. One notable fitment was a screw reverser from one of the derelict RFIRT 2-10-2s. A rear view shows the loco slightly later. The swing out driver's seat reflects not only Shaun McMahon's past experience with the Alfred Country Railway's NGG16s but also the FCAF's open route without overbridges. Ing. 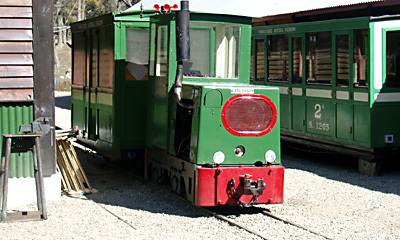 L. D. Porta on a test train in late 2002. 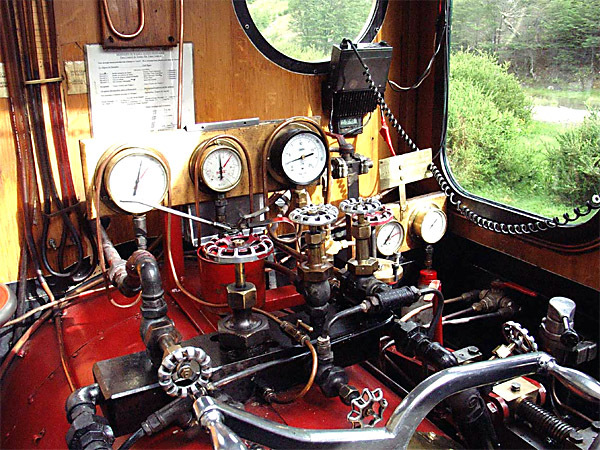 A view from the footplate showing the prominent steam pipes from the regulator valve before their route was made a little more discrete, as shown in the following photo. More recently the loco has been repainted in a new blue livery. The large snow-plough carried through the winter is also clearly visible. 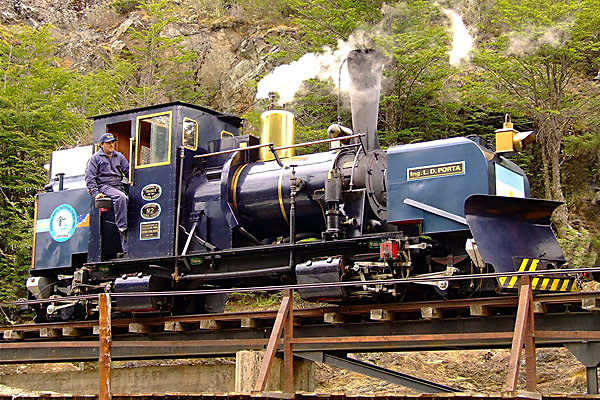 A second stage of modification of the loco was undertaken over the following couple of years. These changes took account of the great advances in steam draughting design made by Ing. L. D. Porta and others in recent years. The insulation of boiler, cylinders and steam pipes, the lubrication system, and the cab controls all received a good deal of thought and attention. After a first stage rebuild in 1999 her haulage capacity on the outward journey (ruling grade 1 in 28) increased from 5 cars to 7, a 40% increase. Much of this was due to the Lempor exhaust, but improved air sanding, improvements in oil combustion, the introduction of Porta water treatment, and a full mechanical overhaul also helped. 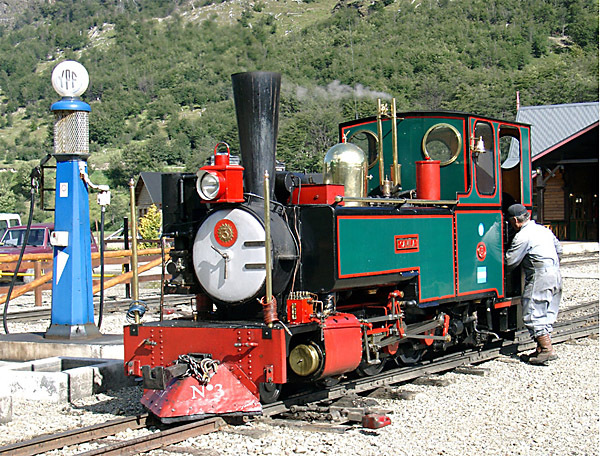 A Talyllyn Railway manufactured air pump replaced the original. Camila at Estación Fin del Mundo depot, showing the tall tapered chimney which is the diffuser for the Lempor exhaust. A good deal of attention has been paid to the ergonomics of the controls within the cab, for FCAF locos are single-manned. This photo, supplied by Shaun McMahon, shows a number of the improvements in the area of the cylinders. It is salutary to realise just how much steam engineers in the past ignored important efficiency gains that could be made by ensuring that the steam pipes were streamlined and that maximum insulation was applied to boiler, cylinders, and all parts of the steam circuit. 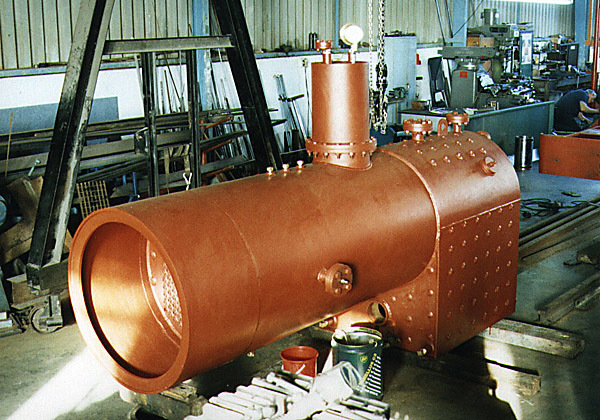 Porta boiler treatment means that boiler washout need only be carried out twice a year, rather than weekly as had been the case on many railways in the past. 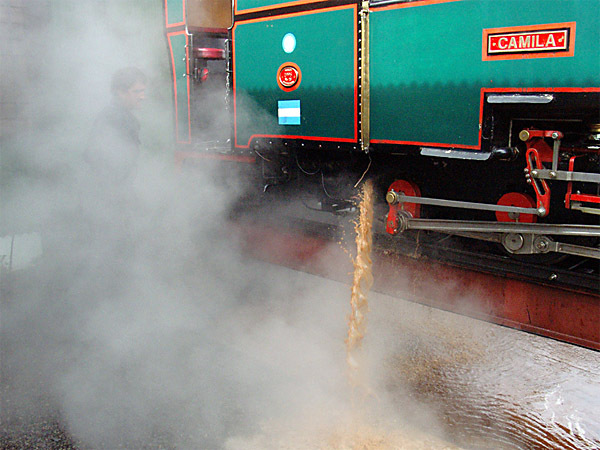 Modern practice is to run with a thick brown soup in the boiler rather than clear water. 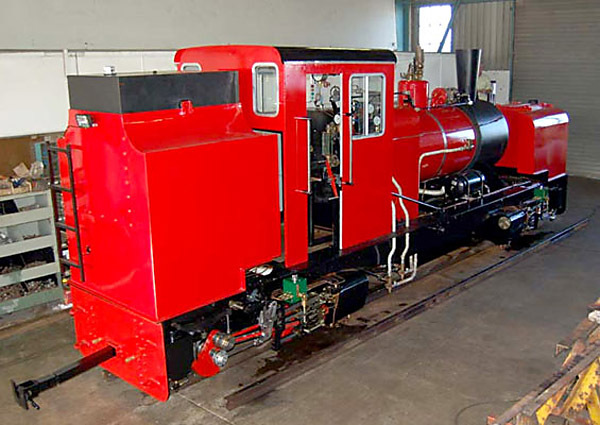 This is an 0-6-0 jackshaft-drive diesel built by Girdlestone Rail in Port Shepstone, South Africa during 1999. 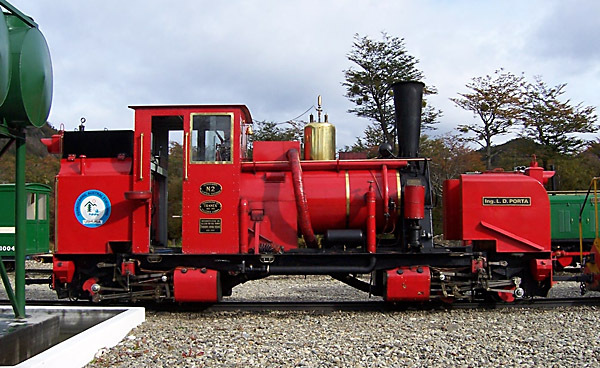 There being no more of the railway's owner's children to name locos after, 'Tierra del Fuego' was chosen, though it might have been more appropriate on a steam engine! A 140hp Caterpillar 3304.T engine is fitted. No. 5, 'Ingeniero H. R. Zubieta'. 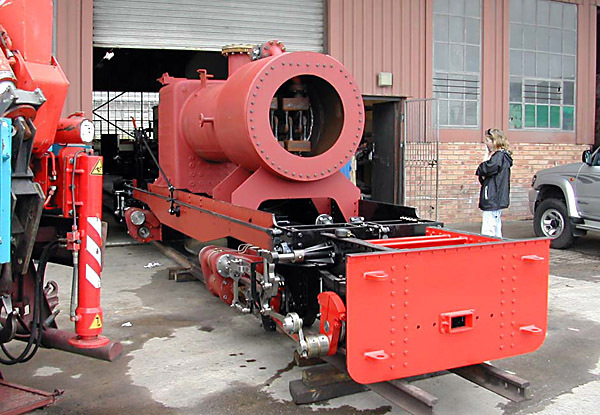 When the railway's first Garratt, Nora, was under construction in 1994, a second set of parts were made and it was expected that a second 'K1' replica would appear in due course. Over the following few years Nora of course changed under Shaun McMahon's influence into a radically different-looking machine - much more powerful and much more economical. It was therefore no surprise that the FCAF's second Garratt eventually appeared looking more like Ingeniero L. D. Porta, as Nora had been renamed. This new machine was constructed by Girdlestone Rail, at Port Shepstone on Natal's south coast in South Africa. It weighs 10 tonnes and can produce 160hp. Entry into service was in 2006. 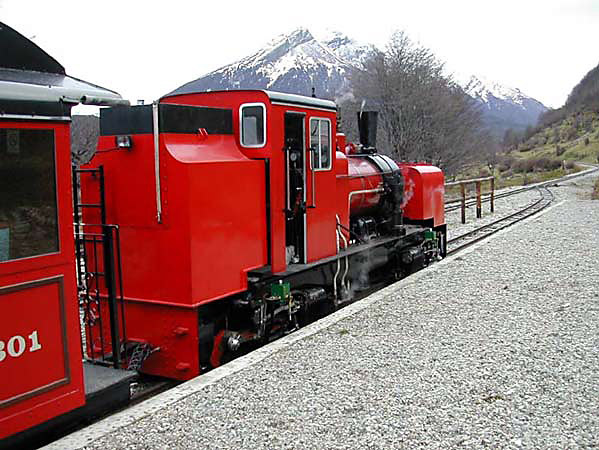 The name commemorates Héctor Rodríguez Zubieta, a distinguished Argentine marine engineer who had strong links with Ushuaia and who had been a strong supporter of the railway. 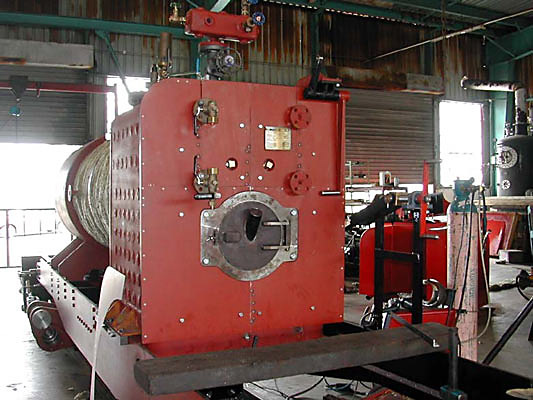 This photo, taken in Port Shepstone, shows the boiler with its newly designed Belpaire firebox, compared to the original round-top that had been in place when the boiler barrel was first used on Nora. The boiler in place on its cradle, and mounted on the bogies. The completed loco before delivery. Ing. H. R. Zubieta coupled to Camila at Puente Quemado. And on a test train at La Macarena before name and number plates had been fitted. 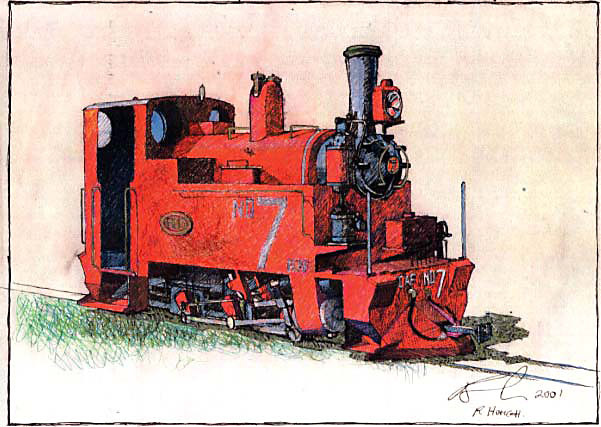 For some years the railway has been considering the construction of a new single engine, possibly an 0-6-2T or 2-6-2T. This would incorporate further hi-tech design innovations being studied by Shaun McMahon in his present main role as an employee of INTI (the Instituto Nacional de Tecnología Industrial) in Buenos Aires. An artist's impression of the possible future no. 7 is shown below. A number of the photos on this page were kindly provided by Shaun McMahon of the FCAF, and others by David Sinclair and Sergio Barral. 1 Argentine adventure. A railwayman at the End of the World. 2004. Chris Parrott. Cheona Publications. Caernarfon. UK. 2 Photos by kind permission of Martin Bane.